The week-by-week progress, if you’re interested. This week I worked on all.the.details, which I will be blogging later because it was way too much that almost made me crazy a lot of DIY. But for now, here are the room deets! 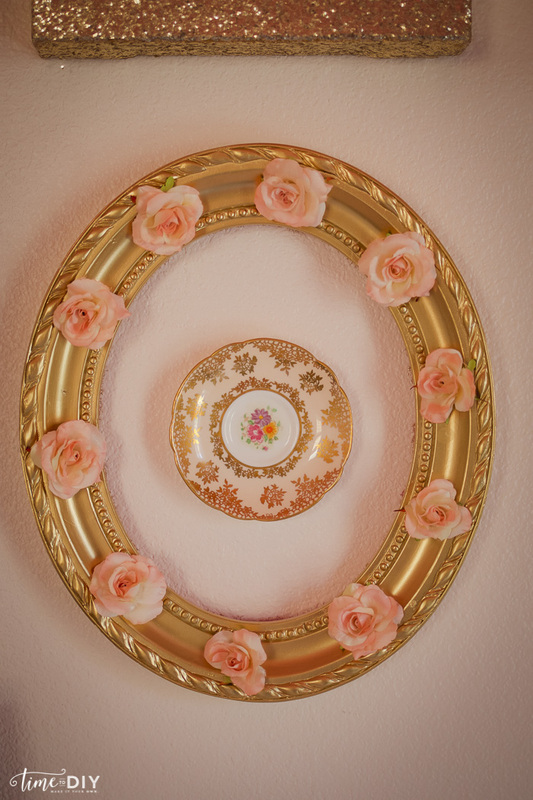 I’ve nicknamed it “The Plaza Room” because it’s got a lot of gold and vintage glam. For the reading corner, I wanted her books to be close to her bed when she transitions to a twin. I decided at the last-minute to switch to rain gutters for the book storage because I liked the molding look, a little bit more feminine than the IKEA spice racks, and they were cheap! 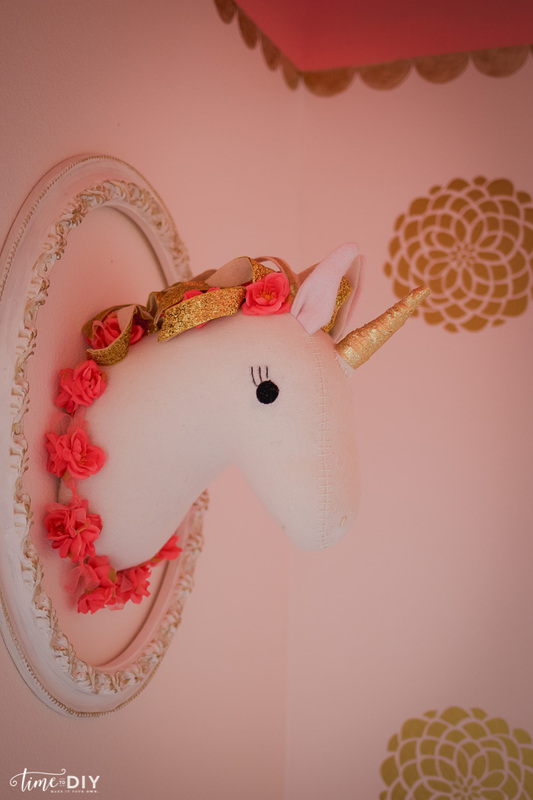 I gave the Target unicorn some glam and the added the frame that I painted with BB Frosch chalk paint powder and then brushed it with metallic gold paint. 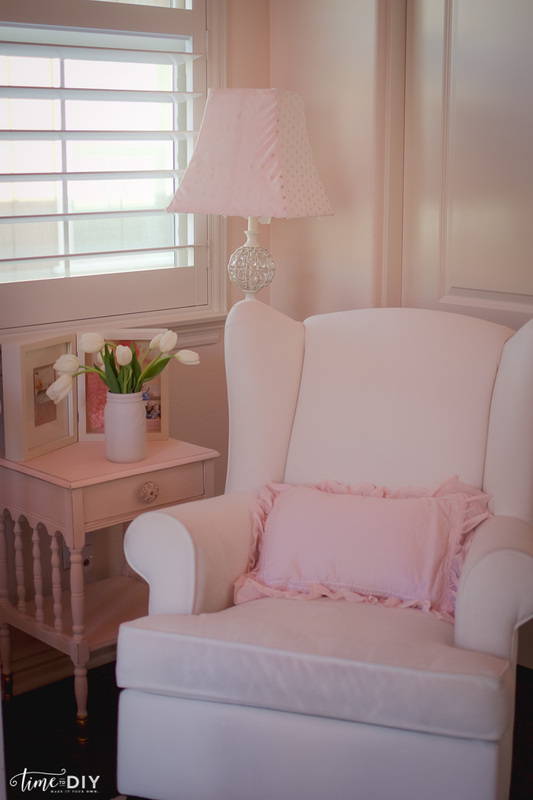 This is the chair from her first year photo shoot, perfect for the reading corner! The gold spray is available on Amazon. The chair is a beast, but my daughter still likes to rock sometimes, and since she’s my last baby, I’m going to milk that as long as possible. I covered the PBK lamp shade with some fabric (which I need to either redo or tweak), and the side table is from a vintage market. The shadow box has her birth announcement and some accessories. 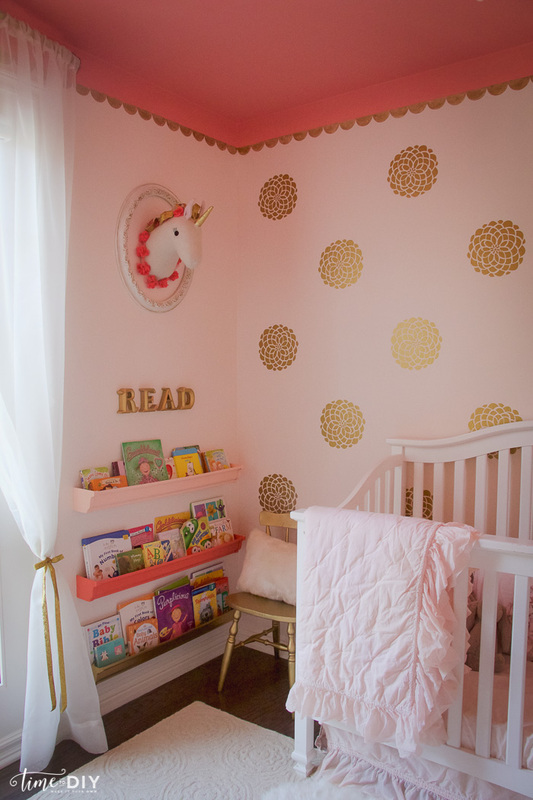 The gallery wall is mostly a mix of DIY and things she had in her Colorado nursery. I did a lot of gold spray painting. 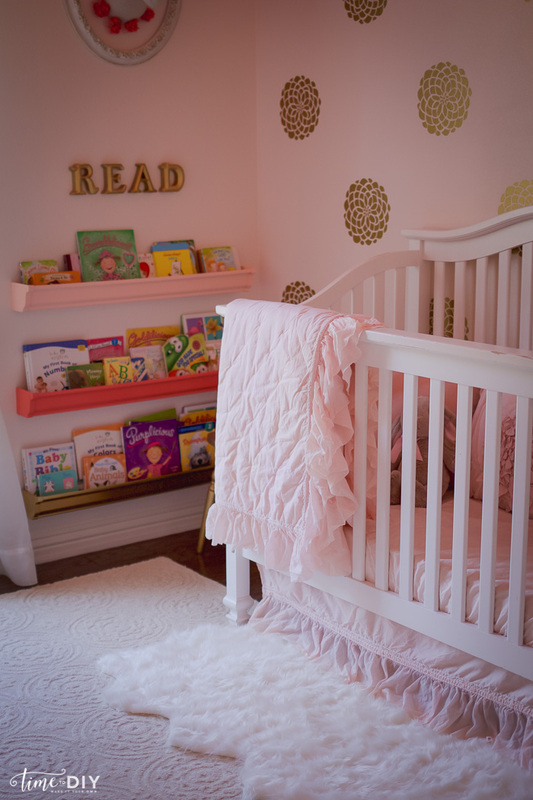 I made the shelves with some lumber that I painted with BB Frosch chalk paint powder, and the brackets I got from my grandma (sprayed them gold). The “Be Kind” and heart were crafts I made at Queen Bee Craft Night. Updating photos is on my to-do list. 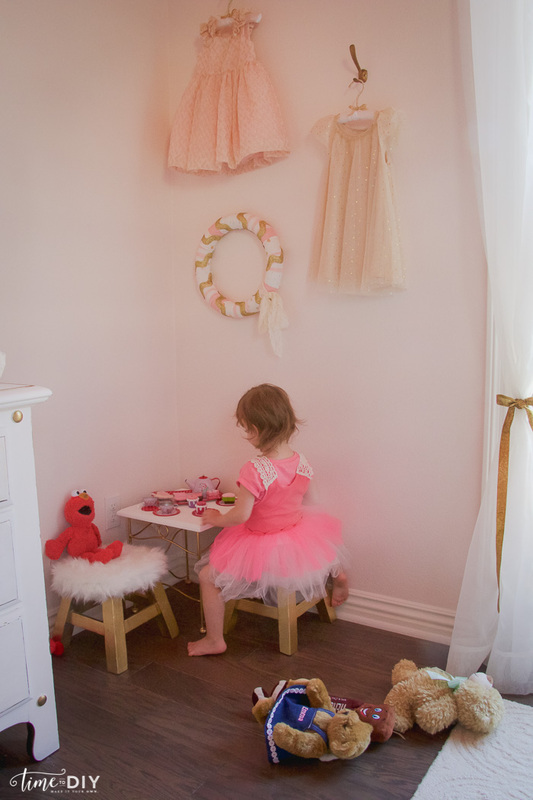 That doll was the inspiration for her entire room, a first birthday present. I added the flowers to the tiny gold frame and made the fabric scraps banner. I sprayed this frame and added the flowers. The saucer is from a vintage market. 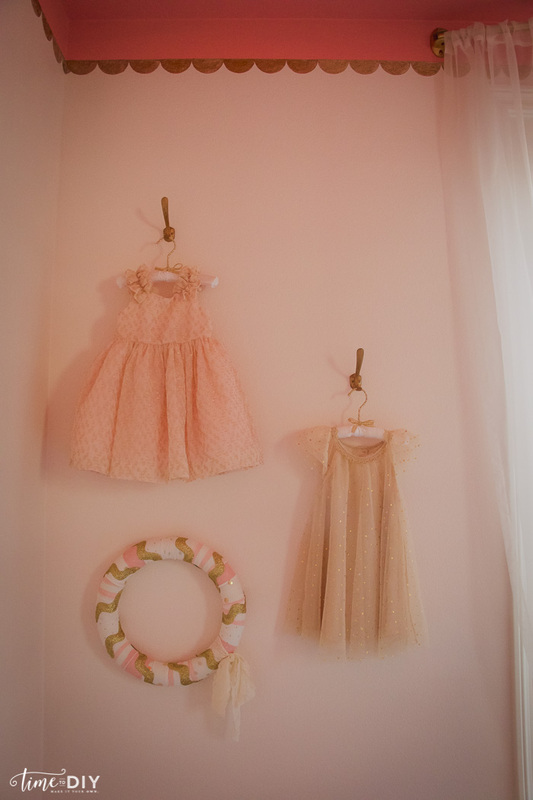 Dresses make great decor, and she wore these for Easter and Christmas so they are extra special. 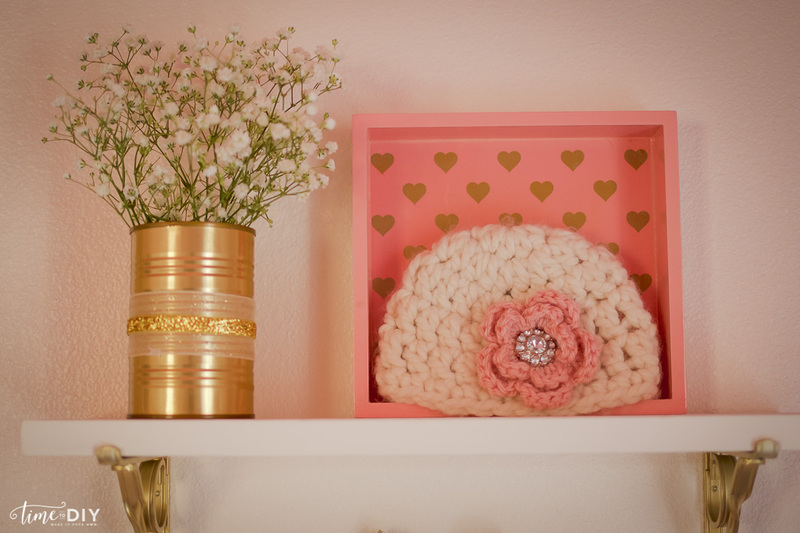 I bought the gold hooks at Hobby Lobby, but there are also these cute gold rose hooks on Amazon I saw later. 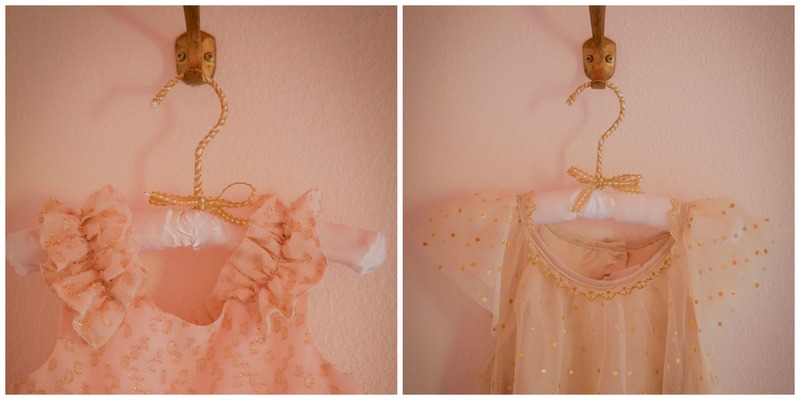 I added some gold ribbon to some hangers I already had to make them a little more glam. 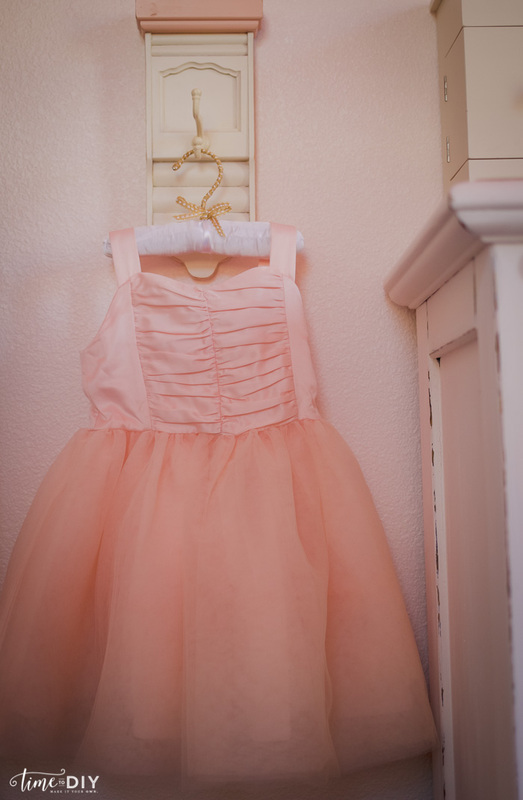 This dress she’s wearing now so that’s why it’s lower, and she can use this little hook for other things like hanging out her school outfits or her dress-up clothes. 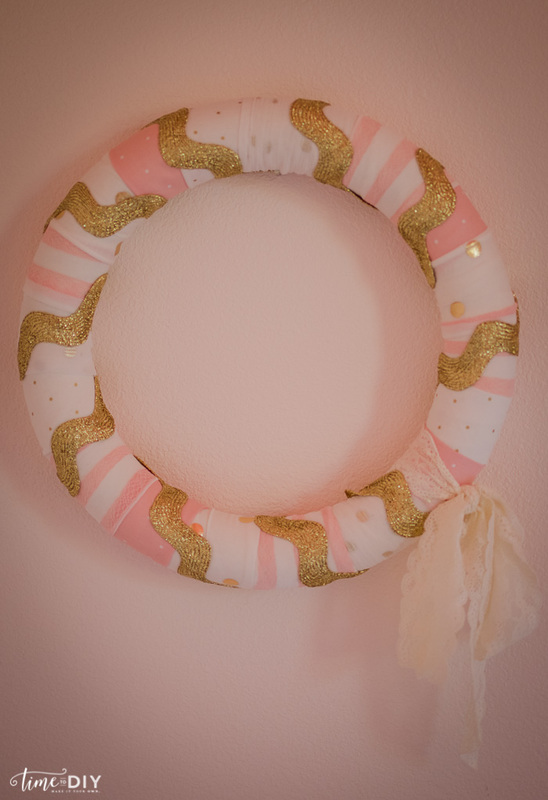 I DIY’d the wreath out of fabric scraps. 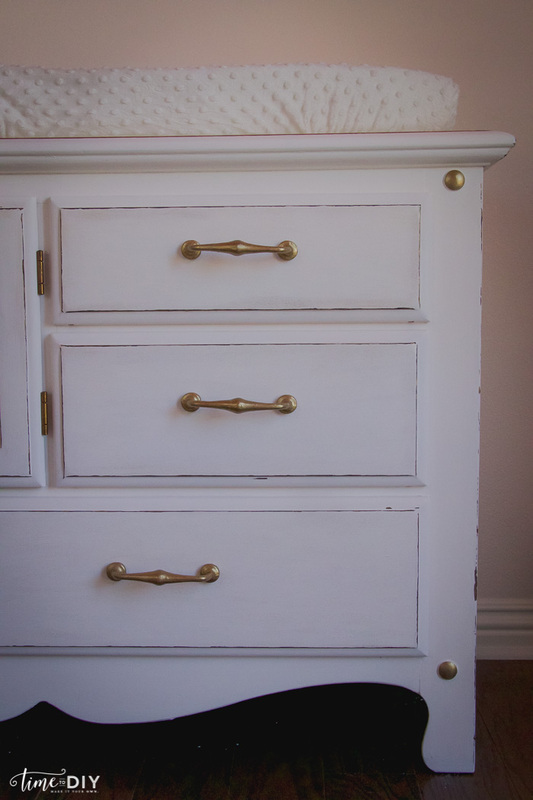 I used BB Frosch chalk paint powder with Benjamin Moore’s “White Mountain Peak” and then distressed and added a thin line of gold. 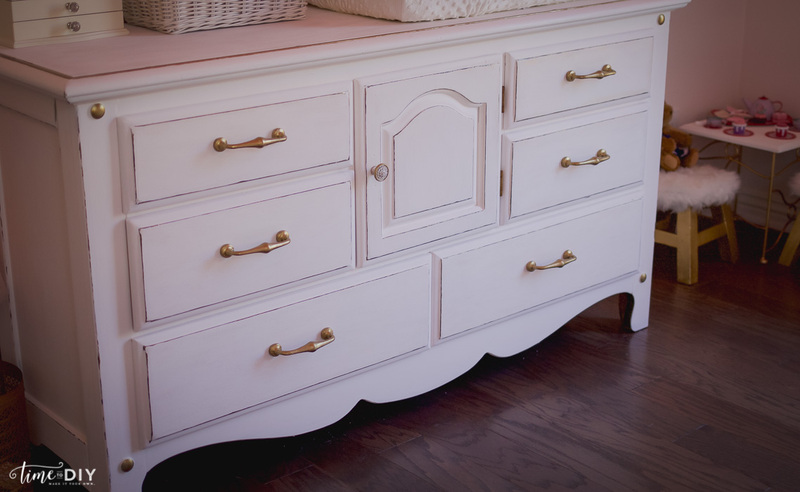 At the end I added some gold dust on the top and front of the drawers, along with some additional gold trim. More details in week 5. 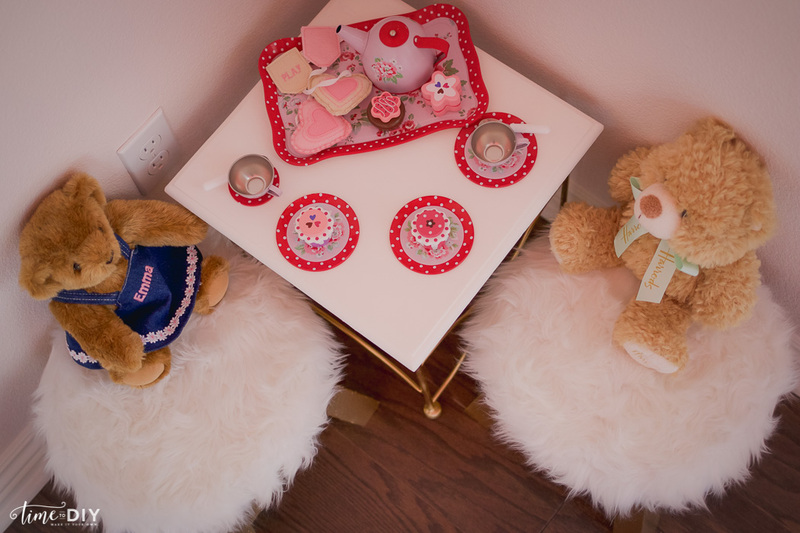 And naturally she needed a tea party corner! I got that plant stand right after college and I updated it for the Colorado nursery. 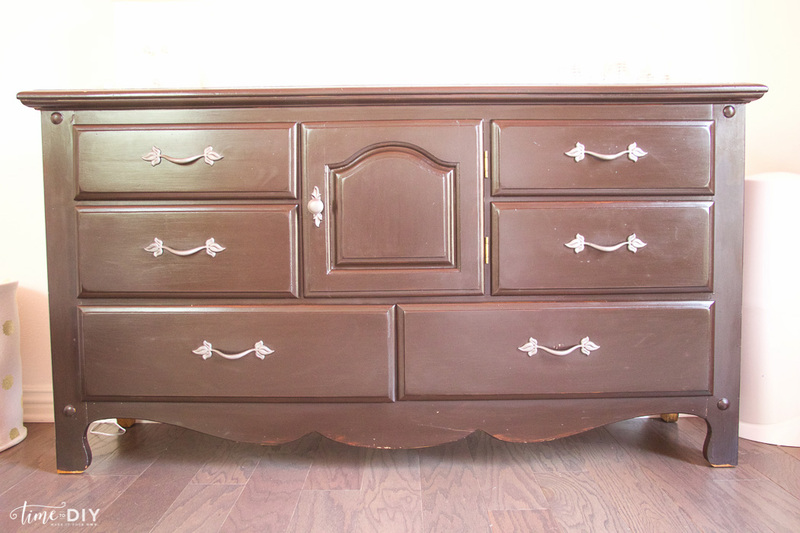 For its second update, I sprayed it gold and used the dresser paint with BB Frosch chalk paint powder. 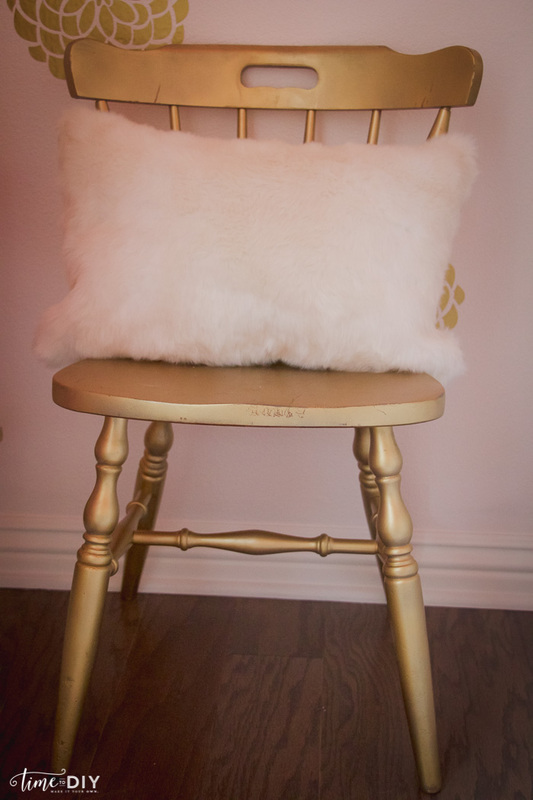 I got the stools at Home Goods, sprayed them and added the fur I got at Hobby Lobby with a staple gun. I adore this tin tea set. I got it at World Market and I can’t find it online anymore, but there is also a similar one on Amazon. I used the leftover fur to cut a rug for the crib. 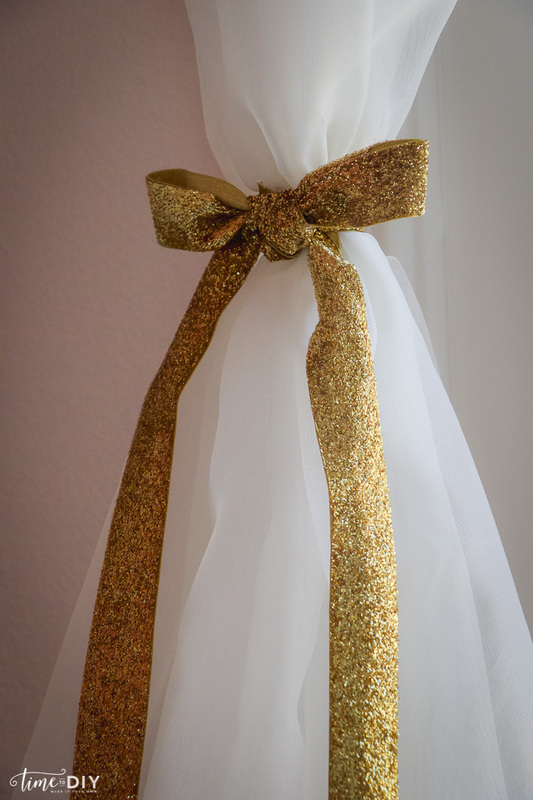 For the Juliet balcony (faux balcony), I used a rounded shower curtain rod, sprayed it gold, and then added some sheers and gold ribbon to tie it off. 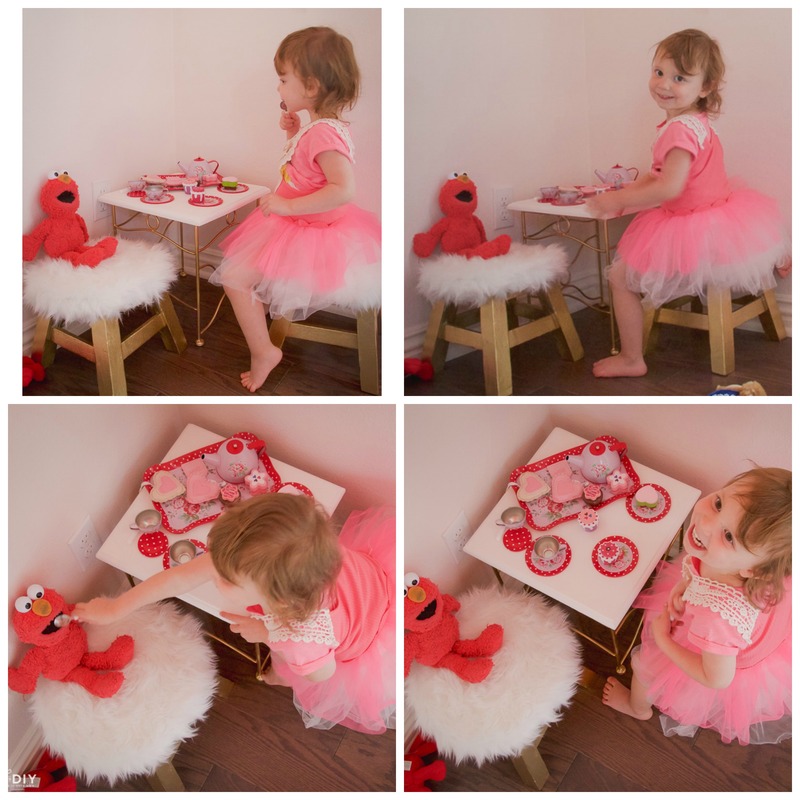 So far her favorite part is her tea party corner! And she loved having tea with Daddy, too! 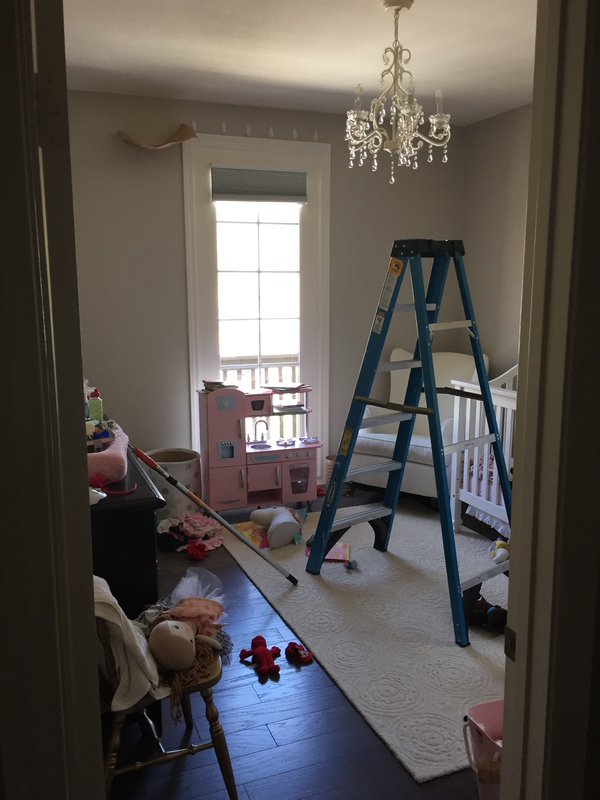 A big shout-out to my hubby, who endured long talks about the room with lots of over-analyzing along the way (he’s a good sport), and he made the whole project possible by helping with the room as well as watching our kiddos and managing the house! He’s the best and I couldn’t have done it with him! Thank you for following along and be sure to check out the other participants’ reveals, there are some A-mazing spaces! And for more of my decor and DIY updates, follow along on social media! Facebook | Instagram | Twitter *Some affiliate links used, but all opinions are my own. It’s so pretty! 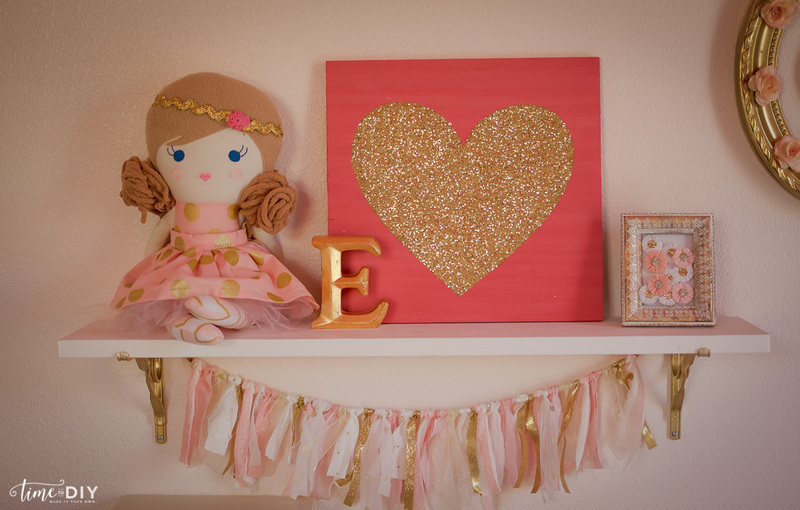 I love gold and sparkles – and that gold scalloped details is amazing. 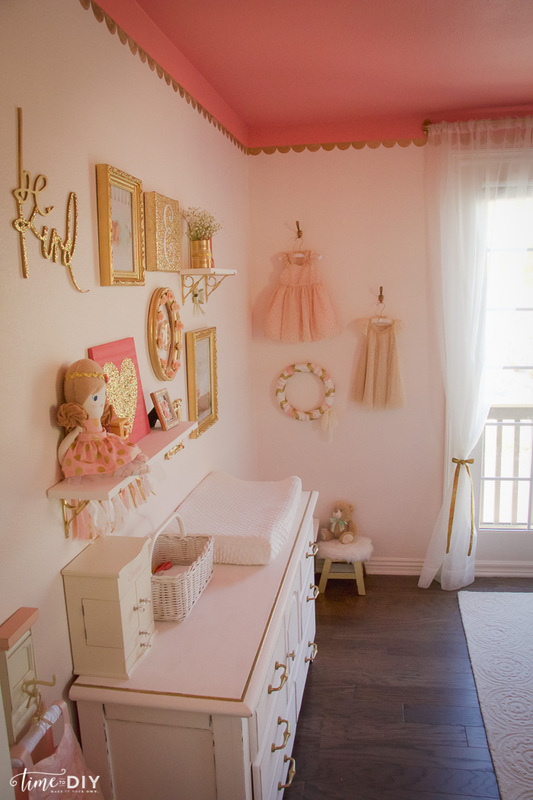 What a sweet room for your daughter! Thank you so much for your sweet comments! 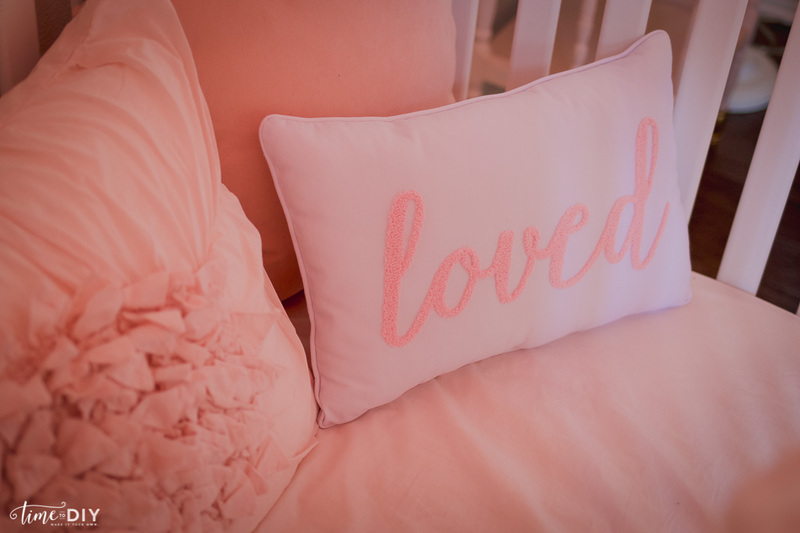 I just checked out your room and LOVE it! Thank you! That was spray paint, can’t remember which brand, I’m sorry! 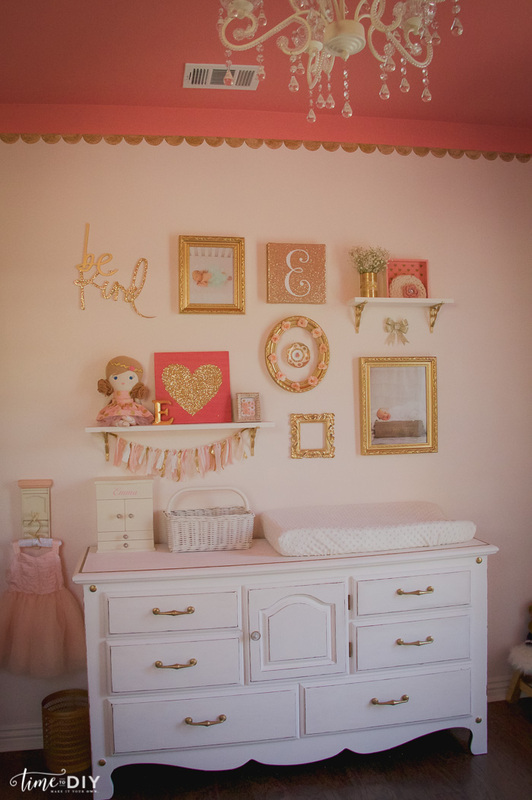 What a sweet little girl’s room. I love all the gold! Thank you so much! 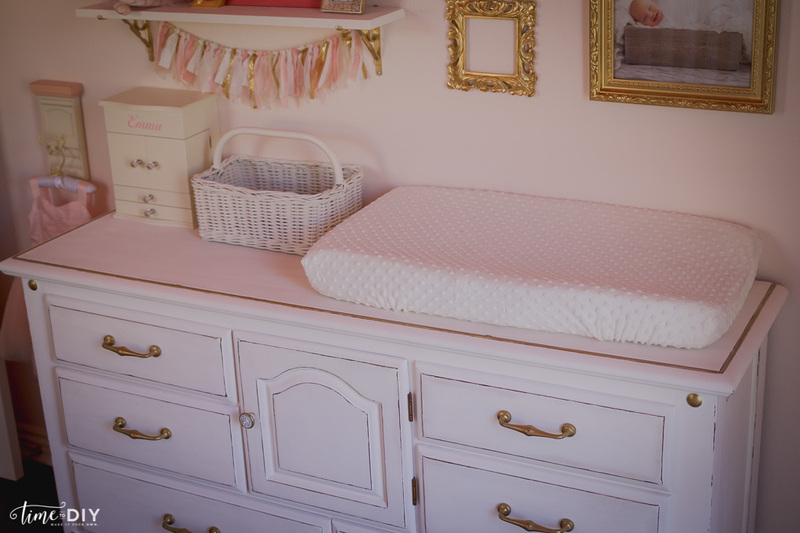 I just looked at your playroom space and it’s so perfect! 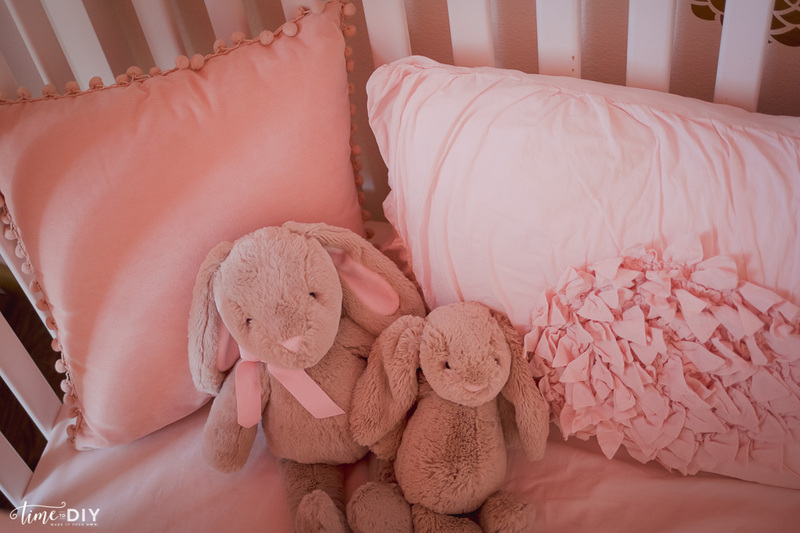 Love all the pink. This is beautiful, Debby!! I love it! Esp the tea party corner and reading nook. The rain gutter book storage is so cool! WOW!!! LOVE it all!!! What great detail you put into the room! 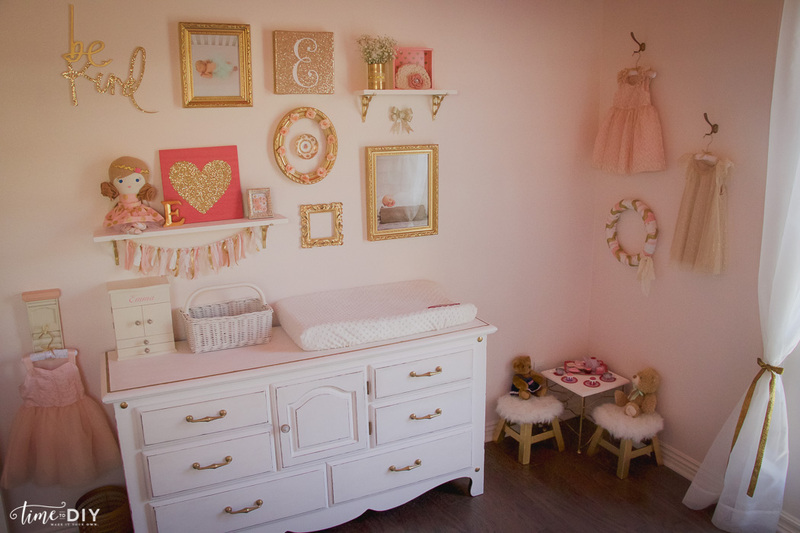 What a cool room for your daughter. You had so many details but I LOVE the pink ceiling idea!!! 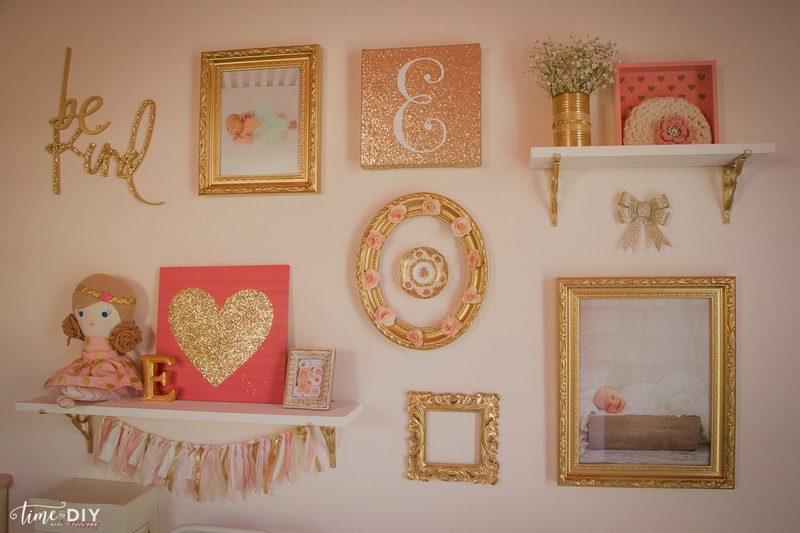 This room is perfect! 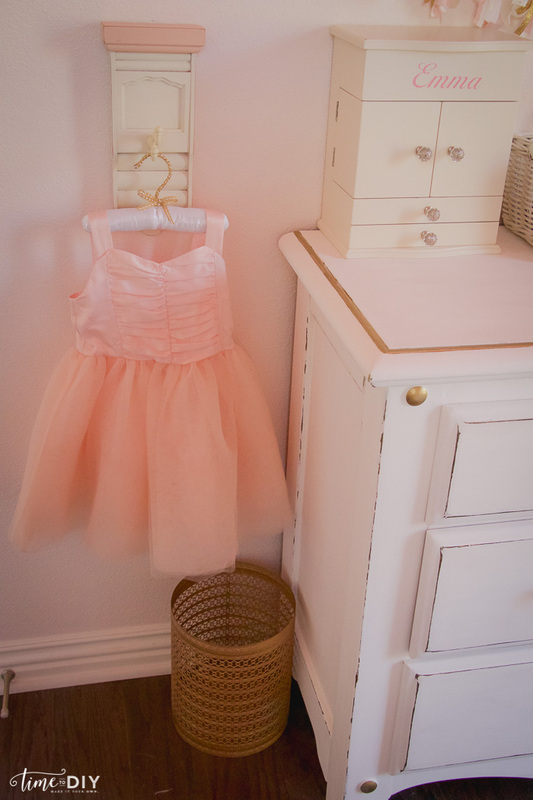 Your princess will have a fabulous time growing up here for sure! The gallery wall is gorgeous! Congrats and CHEERS to us for another room done! So lovely- thanks for sharing! Hi! The room is absolutely gorgeous! 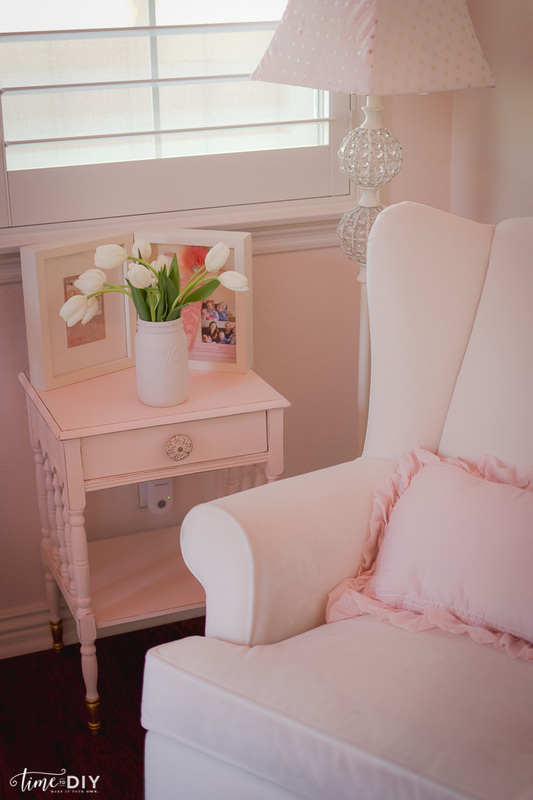 Can you tell me what color blush paint that is and where you got the wall decals from? Thank you! 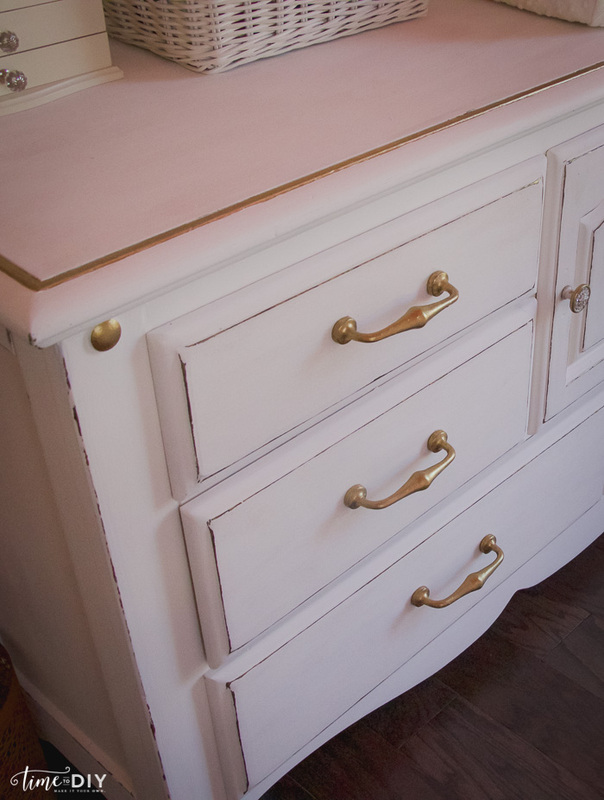 It’s Restoration Hardware “Blush”, but I ran out mid project and had to color match it with Behr paint because I was on a tight deadline. It color matched perfectly! The decals are from Byrdie Graphics http://www.byrdiegraphics.etsy.com. Have fun! Hi! What is the name of the behr paint you color matched with? I painted it on paper and then they scanned it and color matched. The label says “RH Blush”, but I’m not sure if they will have that in the system or not. I just sent a pic of the label to someone else. If you’re on Instagram, shoot me a DM and I will forward it to you. I need to add it to the post, but that won’t happen before Christmas, haha. What size wall decals did you get? The 13″ or the 9″? So sorry, I’m just seeing this! I didn’t realize there were two sizes (I got them on a Jane deal). I will measure them tomorrow! Sorry for the late reply – they were the 9 inch! Beautiful room. Where did you get that gorgeous rug?